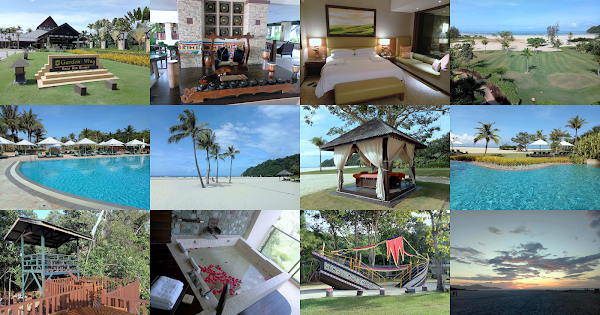 Special thanks to Rasa Ria Resort & Spa for extending this hotel review invitation. Shangri-La's Rasa Ria Resort & Spa is a 5-star beach retreat in Tuaran, approximately an hour's drive from Kota Kinabalu International Airport. 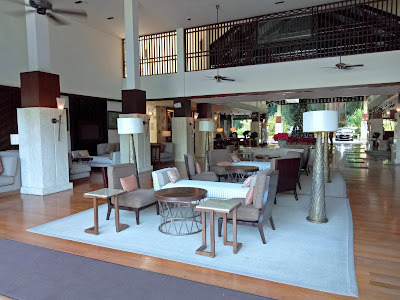 Rasa Ria is massive even when compared to sister properties like Rasa Sayang. 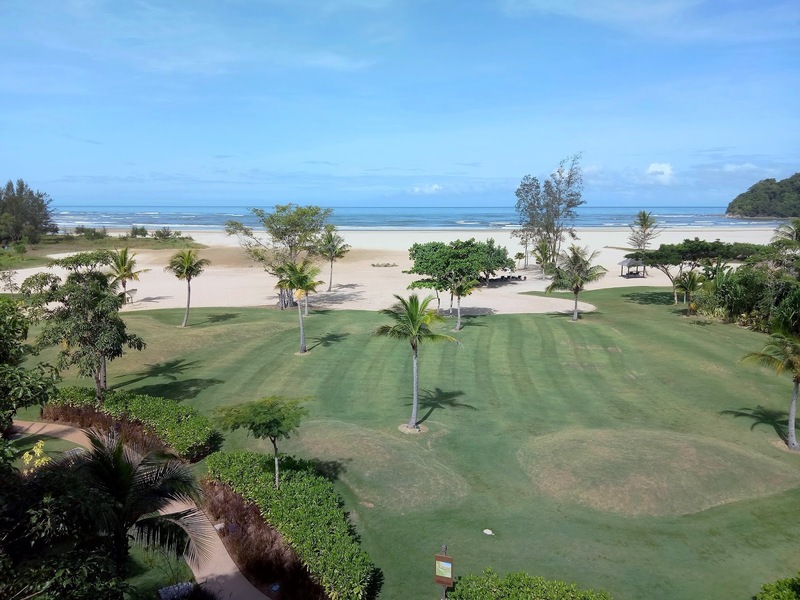 The resort's vast grounds encompasses Rasa Ria Reserve, a 64-acre nature reserve, and Dalit Bay Golf & Country Club, an 18-hole golf course. 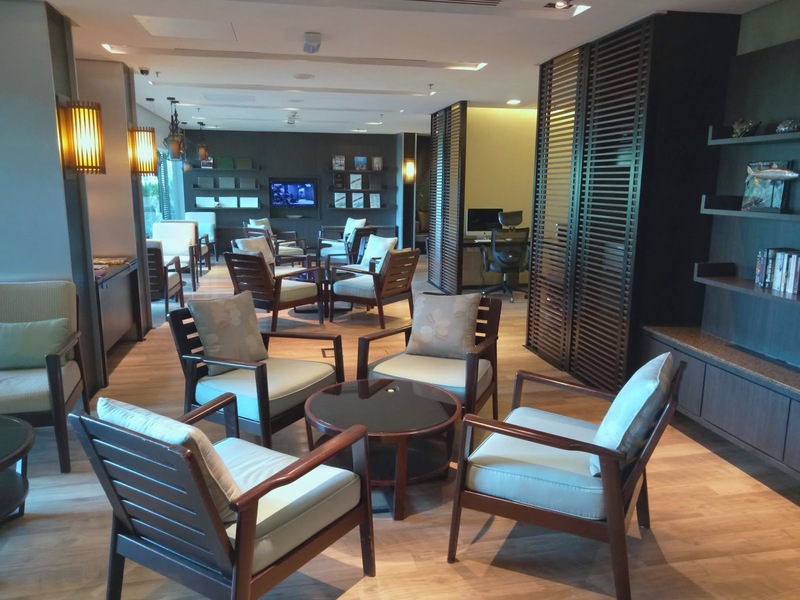 Rasa Ria has 499 guestrooms and suites in total. The hotel is divided into two wings: Garden Wing and Ocean Wing. The Garden Wing is where the majority of guestrooms are located. 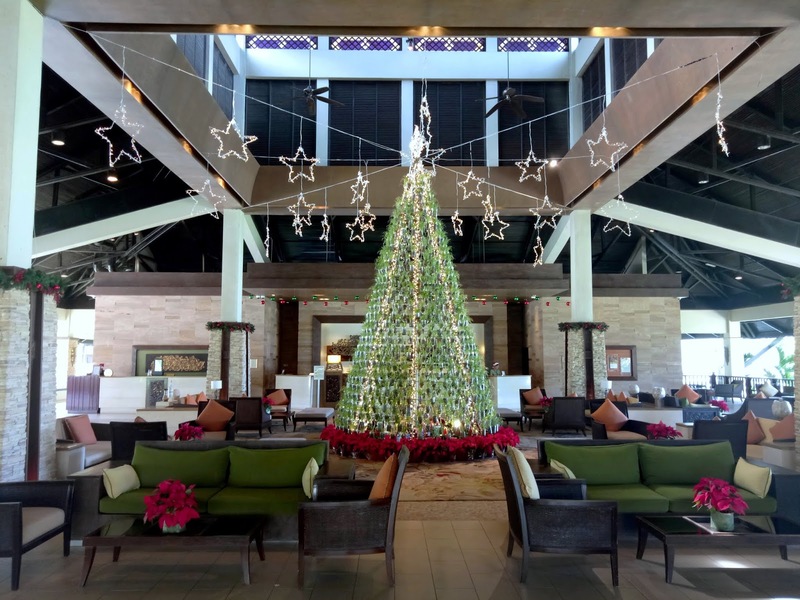 A towering Christmas tree stands in the middle of the open-air lobby. In support of environmentalism, Rasa Ria assembled the tree by using potted plants in recycled plastic bottles. 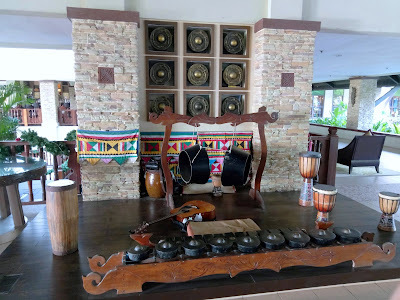 The lobby is decorated with traditional musical instruments such as gong, gendang, sompoton and kulintangan. Kulintangan consists of a row of pot gongs with different sizes; the lowest pitch gong is placed on the player's left. 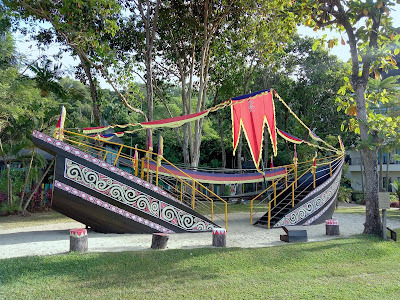 Kulintangan is stuck with two wooden beaters. 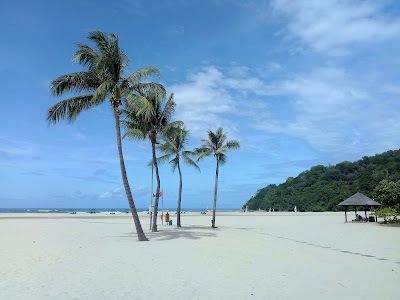 Rasa Ria is renowned for its picturesque Dalit Beach (Pantai Dalit). Measuring two kilometers in length, the beach faces the deep blue South China Sea. Owing to the resort's remote location, the beach here is not as crowded as the one at Shangri-La's Tanjung Aru Resort & Spa. We are staying at the Ocean Wing this weekend. 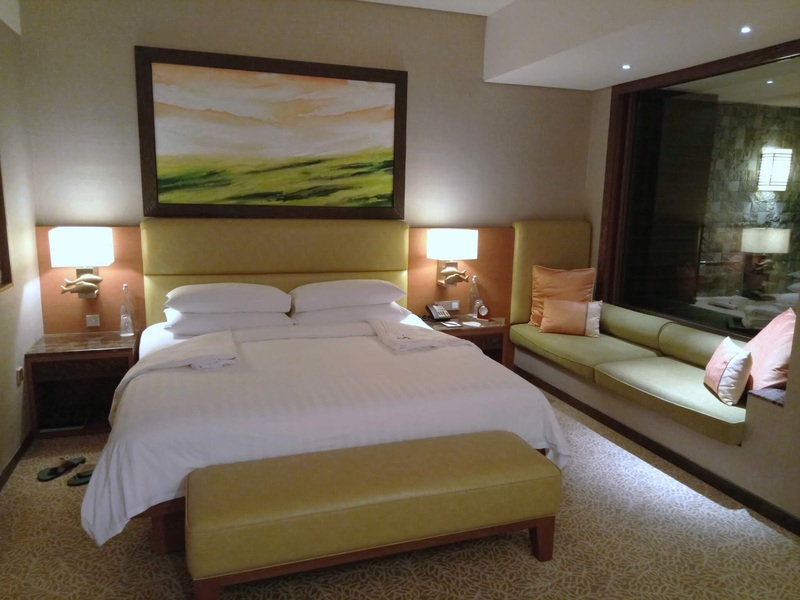 With 173 guestrooms and suites, the Ocean Wing provides the highest level of luxury. 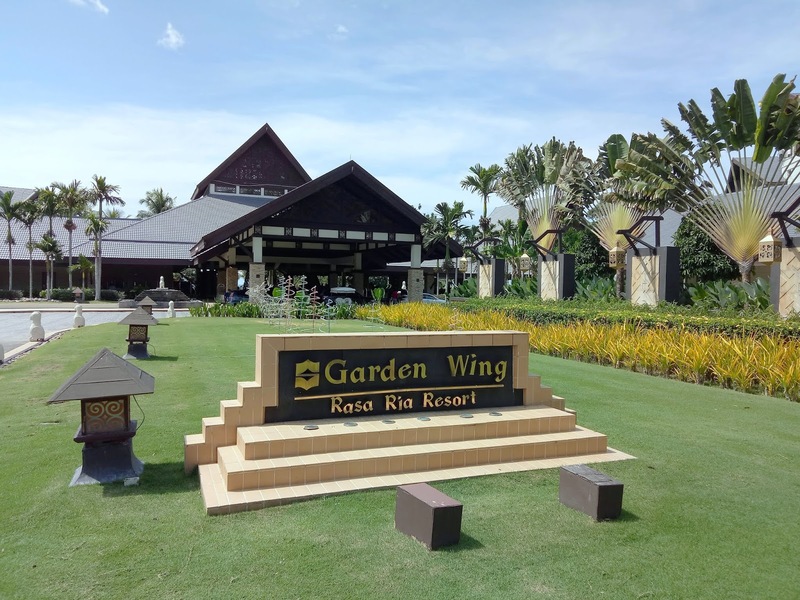 This exclusive wing has a lobby of its own. As both lobbies are separated by a considerable distance, buggy rides are provided for the convenience of guests. 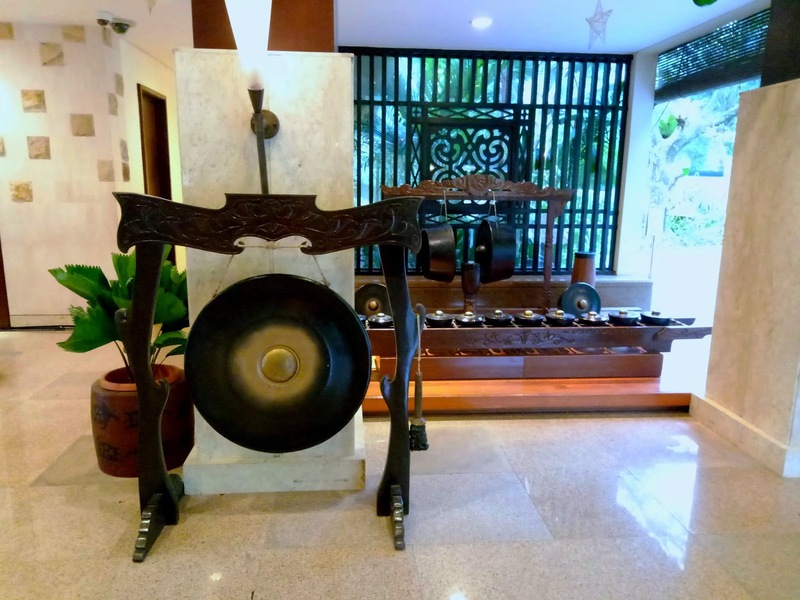 The arrival of each guest is greeted with the strike of a gong and welcoming melody of kulintangan. Ocean Wing guests enjoy special privileges such as exclusive access to Ocean Wing swimming pool and outdoor jacuzzi. Our room, the Premier Sea View Room, covers 90 square meters and is very spacious for two persons. At the center of the room is a king-size bed with a bed bench in front. Next to the glass window lies a cozy daybed. Ocean Wing guests may personalize their pillows; there is a pillow menu with several therapeutic pillows to choose from. Room amenities include a flat panel television with dozens of channels. 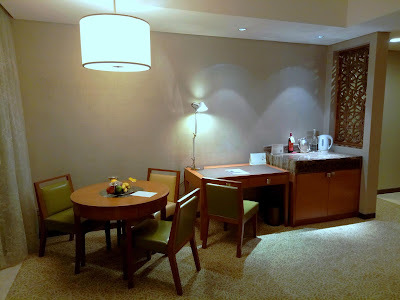 The minibar is stocked with chilled beverages like beer and carbonated water. Snacks are provided too. 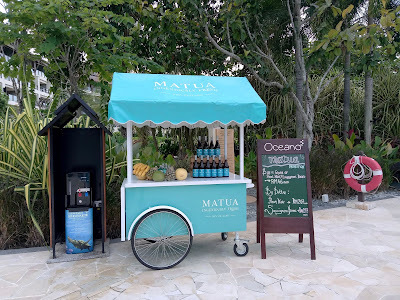 As Rasa Ria has its own water bottling facility, drinking water is filled in reusable glass bottles. 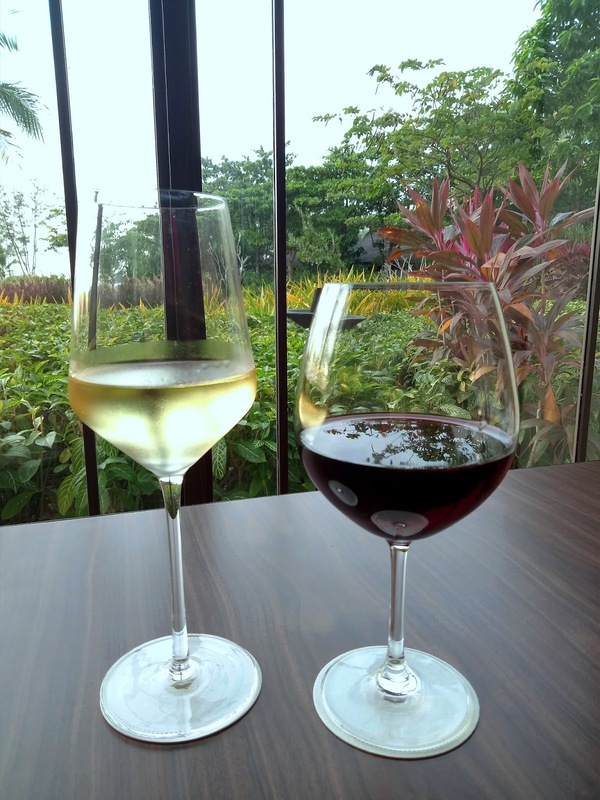 With the exception of red wine, all consumables are complimentary for Ocean Wing guests and are replenished daily. In the bathroom, a marble countertop with dual sinks presents an opulent appearance. 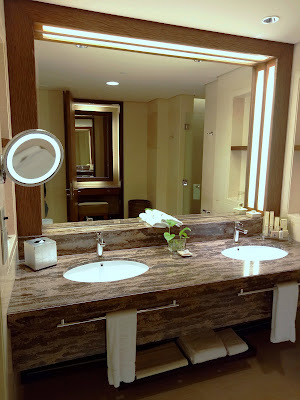 Complimentary toiletries, courtesy of L'Occitane, are provided. The bathroom is also stocked with bath towels, bathrobes and beach slippers. Our room has a huge balcony with sweeping views of the sea. 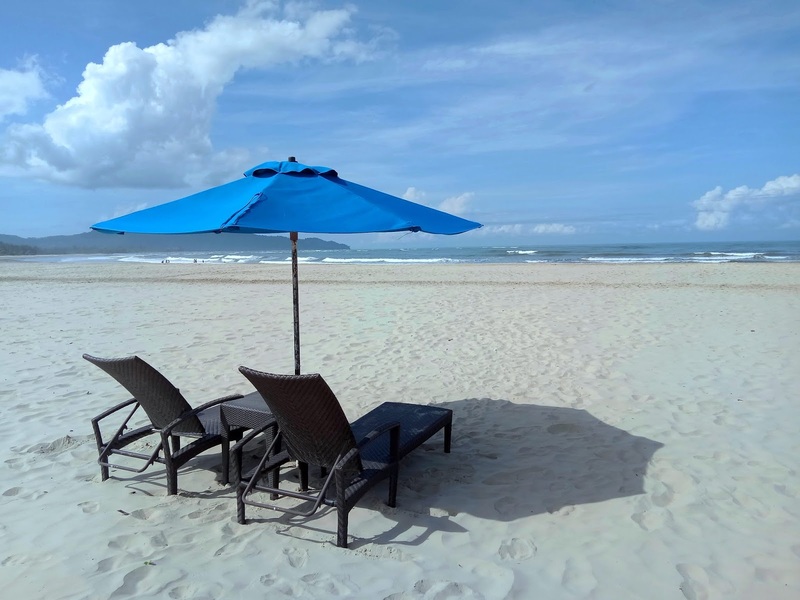 Cushioned chairs allow us to relax and enjoy the cooling breeze that blows perpetually from the sea. Of course, the main highlight at the balcony is an oversized whirlpool bathtub. Once per stay, guests of Ocean Wing may request for a complimentary bath indulgence. Available options are Deluxe Bubble Bath, Mineral Bath Salts and Rose Petal Bath. 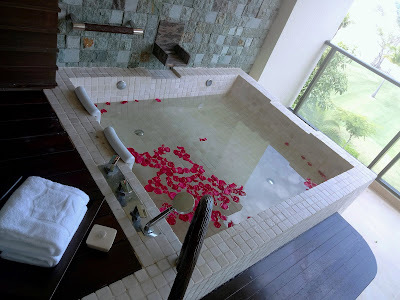 After an exhausting day exploring the resort, it is nice to pamper ourselves with a warm bath in the whirlpool bathtub. The Ocean Wing has a lagoon-shaped swimming pool that is exclusive to its guests. Since there are fewer people here, the pool area presents a more private setting. The main swimming pool is open from 7:00am to 7:00pm. There are lifeguards on duty. 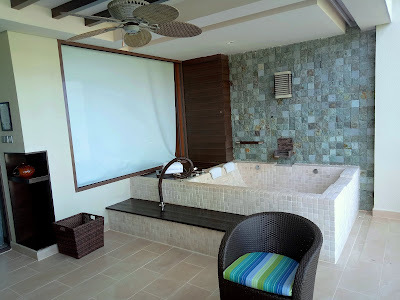 Next to the swimming pool is an outdoor jacuzzi, which is meant solely for Ocean Wing guests. With scenic views of Dalit Beach, the jacuzzi is the perfect spot to unwind in the morning and the evening. Ocean Wing has several well-kept green lawns. 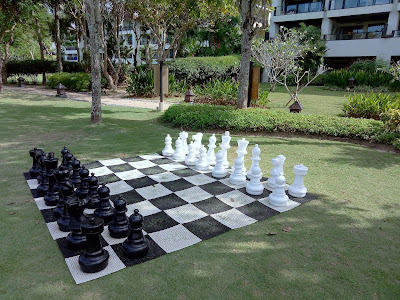 In the middle of a private garden is an oversized chessboard. As for guests who enjoy sunbathing, countless sunloungers are scattered throughout the entire the pool area. Guests can easily order drinks and snacks from kiosks like Ice Monkee and Sampan Bar. Popular cocktails at Sampan Bar are Tebu Mojito, Nanas Pandan Colada and Kayu Manis Whisky. Happy Hour runs from 4:00pm to 9:00pm daily. Rasa Ria has one of the most amazing beaches in Sabah. The white sands of Dalit Beach stretch two kilometers from end to end. I am also surprised that it is a 200-meter walk from the resort's green lawns to the water's edge! The wide expanse of Dalit Beach is sporadically dotted with coconut palm trees and gazebos. Several pavilions on the beach provide the perfect setting for romantic dinners. Enjoy a glass of champagne while immersing yourself in the enchanting view. 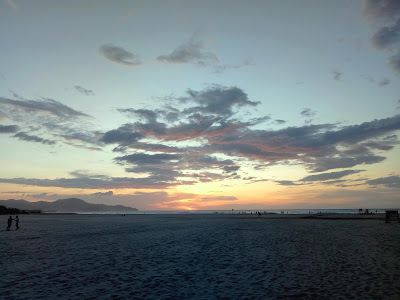 Of the many beaches that I came across, Dalit Beach is among the best that I had the pleasure of setting foot. The white sand here is as fine as powder! The best way to appreciate the powdery sand is by walking barefoot. I must also acknowledge that the beach is virtually devoid of marine debris. The South China Sea lies beyond Dalit Beach. 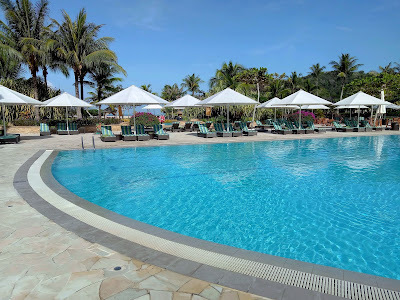 On a sunny afternoon, it is certainly tempting to take a dip in the cooling water. While it is generally safe to swim, Rasa Ria posts a lifeguard here to keep an eye on things. Guests who wish to venture further from the shore can visit the Water Sports Centre. Popular sea activities include jet skiing and parasailing. Most of these activities are chargeable. 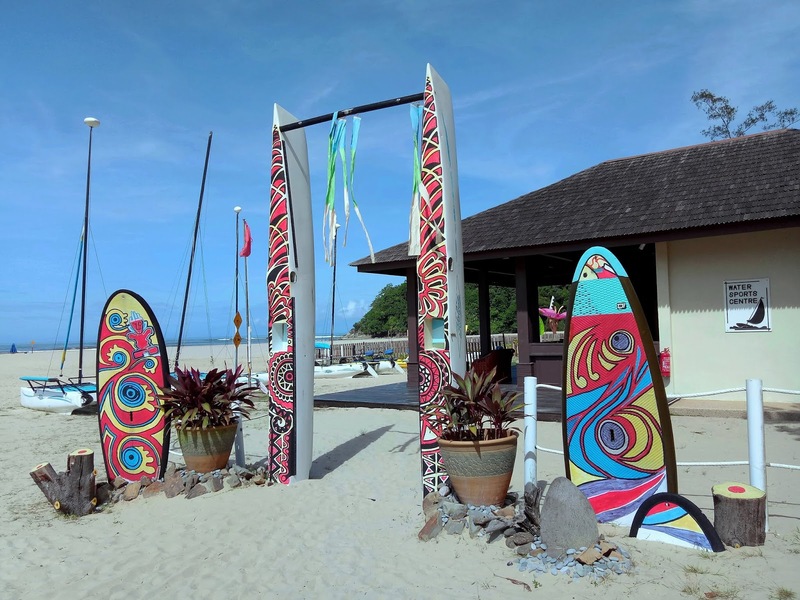 However each day, resort guests enjoy 1-hour complimentary use of the boogie board, ocean kayak and catamaran. 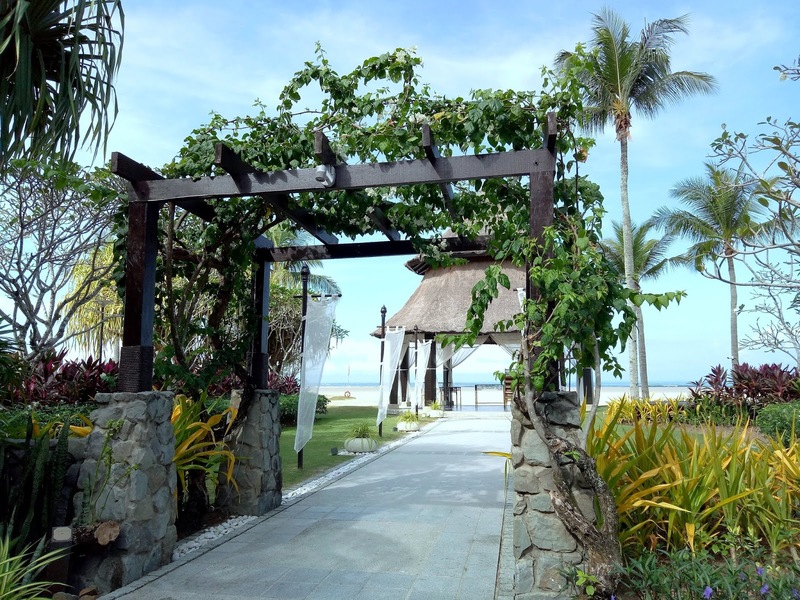 The Wedding Pavilion provides an idyllic spot to exchange vows. You cannot ask for a more romantic setting than the beautiful white beach as the backdrop! Rasa Ria has a comprehensive range of wedding packages. 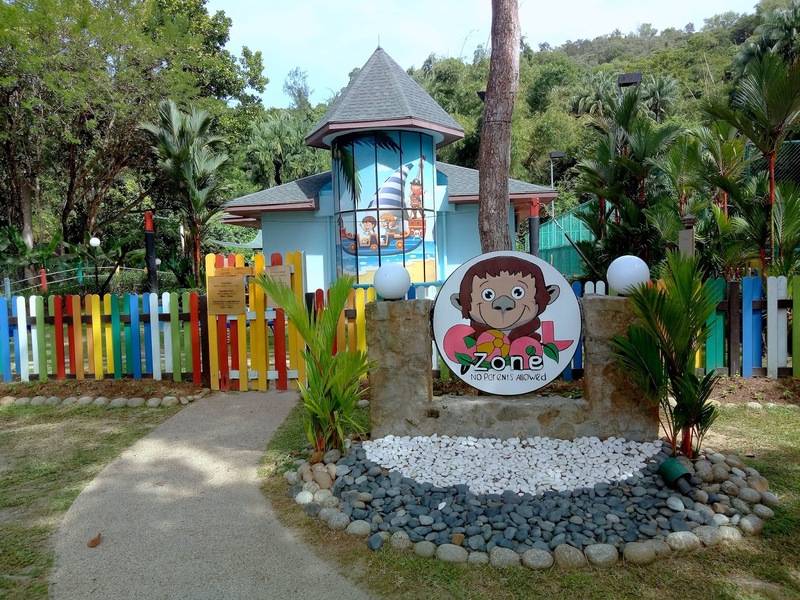 The Cool Zone Kids Club is meant for children between ages 5 and 11. This amenity allows parents to leave their children in good hands while they enjoy some private time. There are plenty of indoor and outdoor activities to keep the young ones entertained throughout the day. For instance, the Sunken Ship is a popular spot for children to play. A hanging bridge connects both ends of the "broken ship". 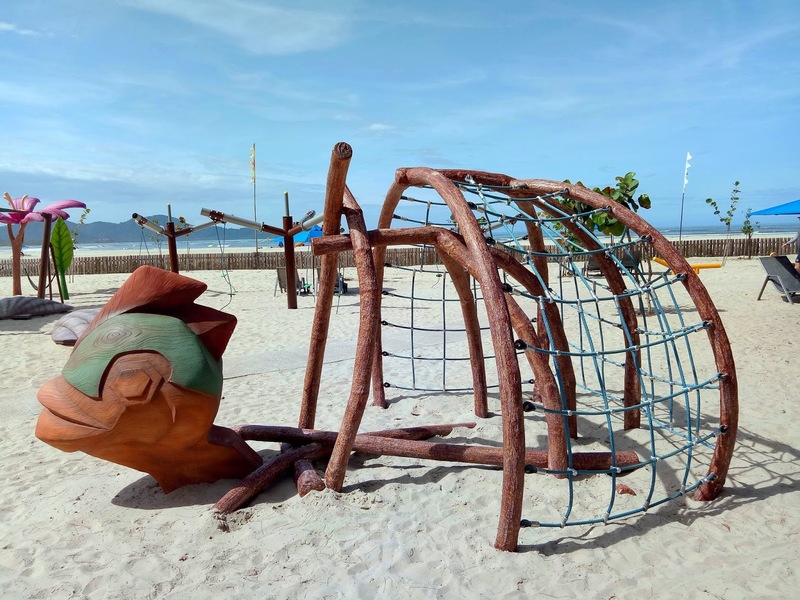 Adventure Point is an outdoor playground on the sandy beach. 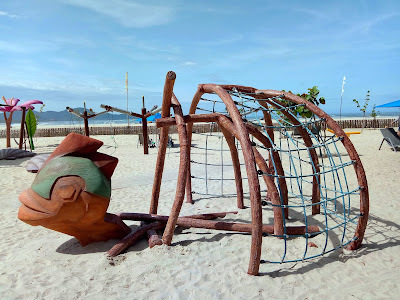 The place has a large number sandpits, swings, balancing beams, climbing wall and animal play sculptures. Adventure Point is suitable for children between the ages of 4 and 12. Parents are advised to supervise their kids at all times. 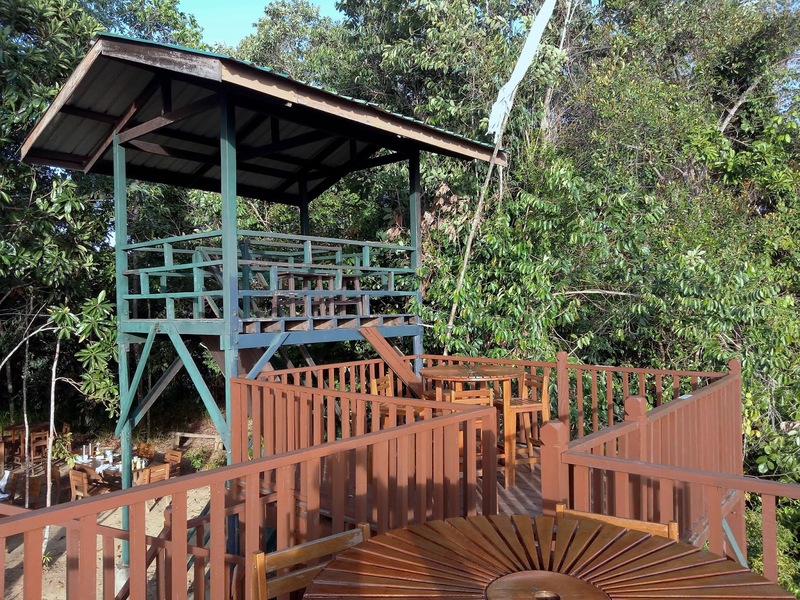 Located on a headland next to Dalit Beach, Rasa Ria Reserve encompasses 64 acres of virgin tropical jungle. Only a small section the nature reserve is open to visitors; the remaining sanctuary is kept untouched. 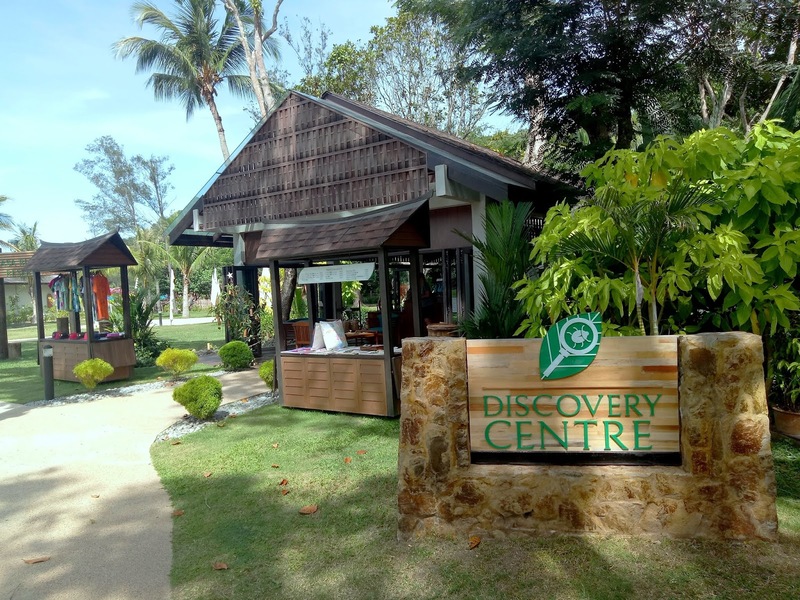 The Discovery Centre serves as the gateway to Rasa Ria Reserve. 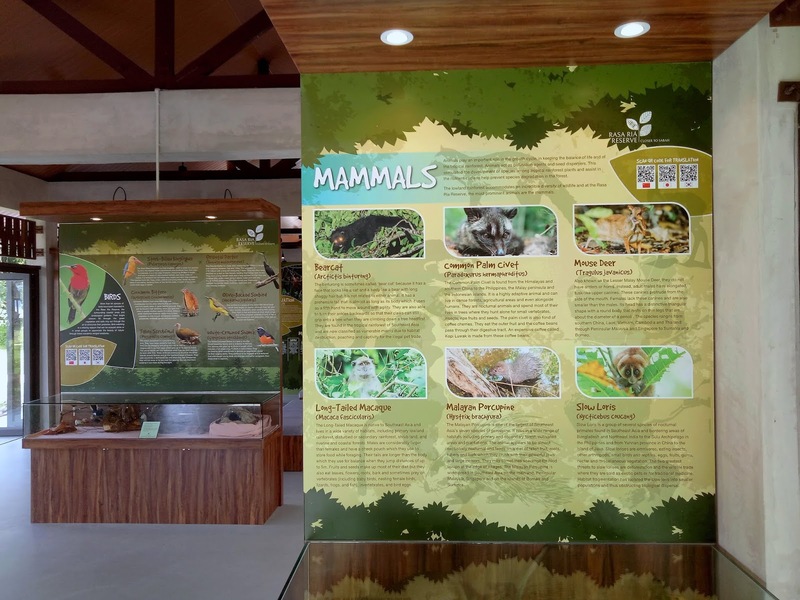 The Discovery Centre gives an introduction to Rasa Ria Reserve, including the fact that it started as a rehabilitation center for orang utans. There are many exhibits of indigenous animals and plants that can be found in the nature reserve. The Discovery Centre is open to the public. Visitors are also welcome to stroll in a small garden behind the Discovery Centre. This area features a number of tropical herbs and spices. There are also several colonies of stingless bees. Stingless bees can be raised for their honey. 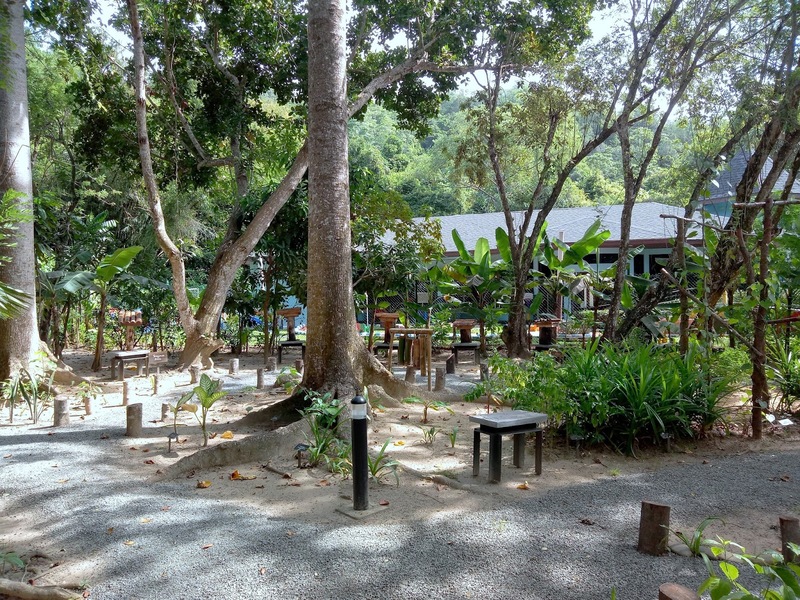 Rasa Ria Reserve has several trails with varying lengths. 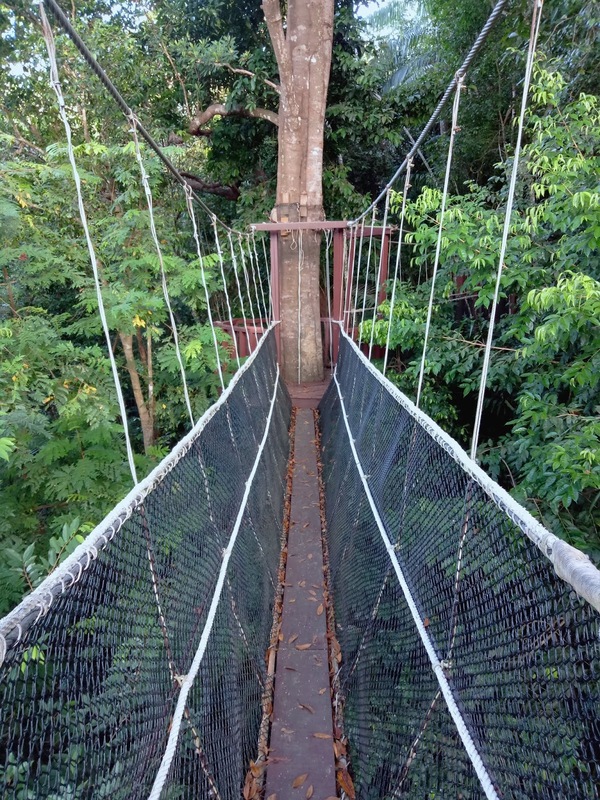 Points of interest include a canopy walkway and animal watering hole. Guided hikes can be arranged at the Discovery Centre. For safety reasons, visitors must be escorted by park rangers at all times. 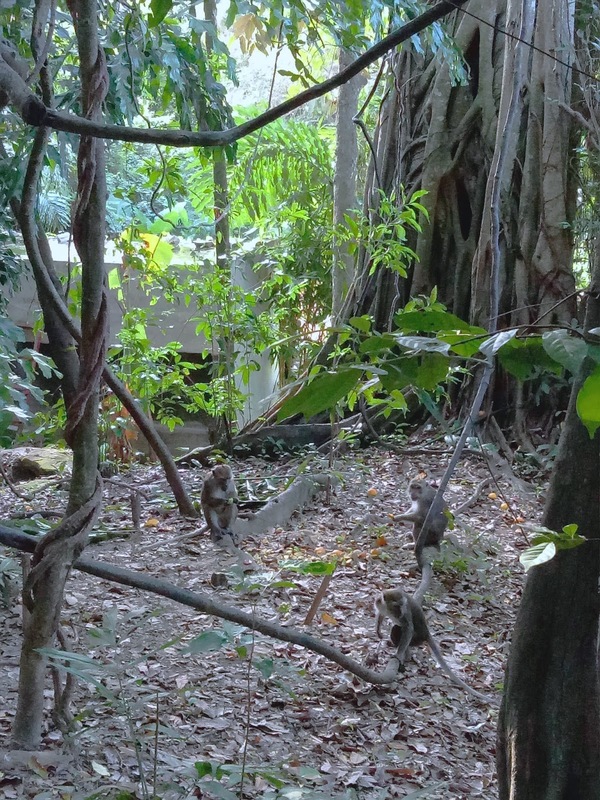 The lush tropical forest is home to small mammals, birds, reptiles, arthropods and plants. If you are lucky, you might encounter a troop of long-tailed macaques (Macaca fascicularis). Keep a safe distance from them as these wild animals are not accustomed to human contact. Many animals in the nature reserve are nocturnal. Therefore, the best way to watch them is by talking a Night Walk. Night vision goggles allow visitors to view these animals in total darkness. The goggles also have camera functions. The Night Walk starts at 7:30pm and usually takes 2 hours to complete. 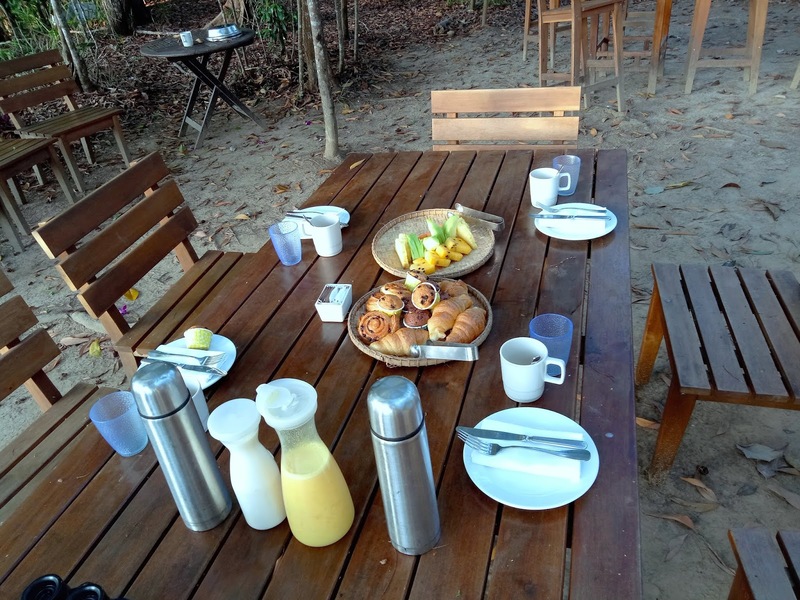 To get closer to Mother Nature, guests may also opt to have breakfast in Rasa Ria Reserve. "Breakfast With A View" provides an excellent view of sunrise. The experience starts at 5:30am with a guided hike to Ria Lookout. Perched on Ria Lookout is an observation tower. From here, visitors enjoy panoramic views of the surrounding area. 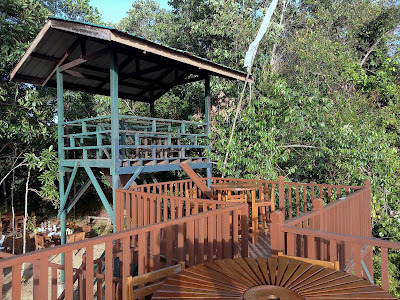 To the west of Rasa Ria Resort are large tracts of mangrove forest. On a clear day, one can even see the majestic Mount Kinabalu about 50 kilometers away! Breakfast is served on picnic tables under the trees. Due to limited space, the place can only accommodate 20 people every day. This unforgettable experience is definitely worth the early morning wake up! Dalit Bay Golf & Country Club is an 18-hole golf course within the resort's grounds. In-house guests enjoy special rates when using its facilities. The main building in the country club is where the Golfers' Terrace and The Spa are located. 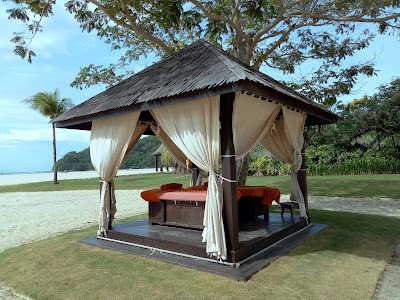 Treatment options at The Spa include traditional body massages using natural herbs that can be found in Sabah. Alternatively, guests may also request for massage appointments on the beach. There are several pavilions for this purpose. Coffee Terrace is Rasa Ria's all-day dining restaurant. Located at the Garden Wing, this is where most in-house guests have breakfast. The eatery also serves buffet dinner every evening. The buffet theme rotates throughout the week. For instance on Saturday, the theme is "Taste Of Asia". 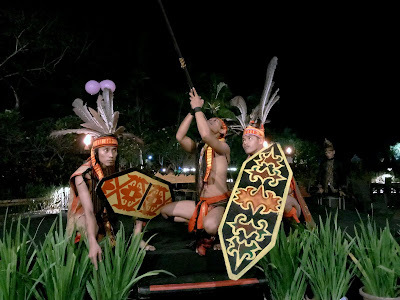 Cultural performance is held at Coffee Terrace every Wednesday and Saturday evening. The program showcases traditional dances of native Sabahan tribes. The performance concludes with a spectacular "magunatip" dance, after which diners can also participate. The cultural performance was supposed to take place at the seaside restaurant, Tepi Laut. 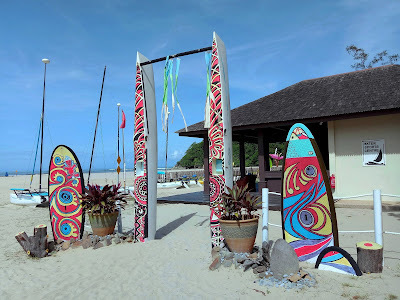 However, Tepi Laut is currently closed for renovations. Ria Café is a cozy spot where guests can pass the time in a casual setting. 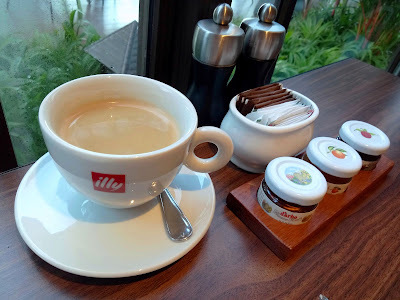 The coffee here is brewed from illy coffee beans. Ria Café also serves sandwiches, ice cream and other snacks. There are several computer terminals that allow guests to access the Internet. 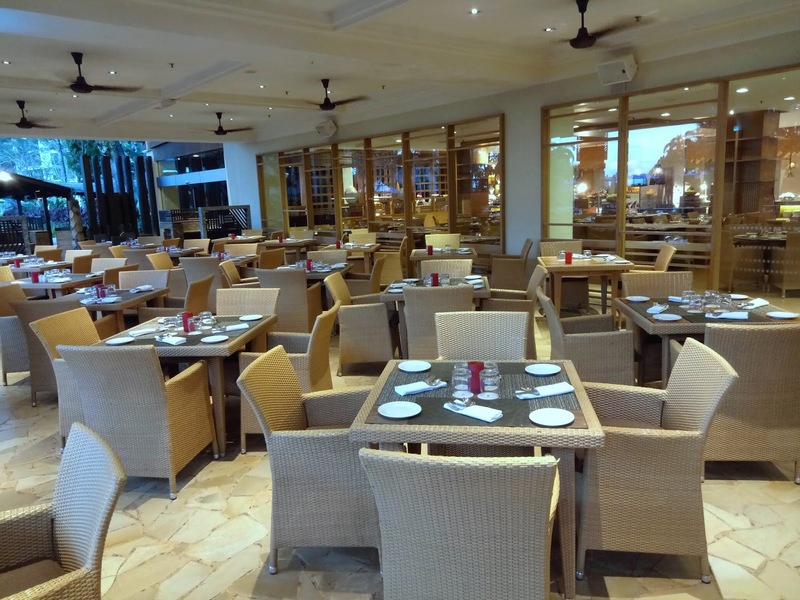 Naan - Flavours of India is Rasa Ria's award-winning Indian restaurant. 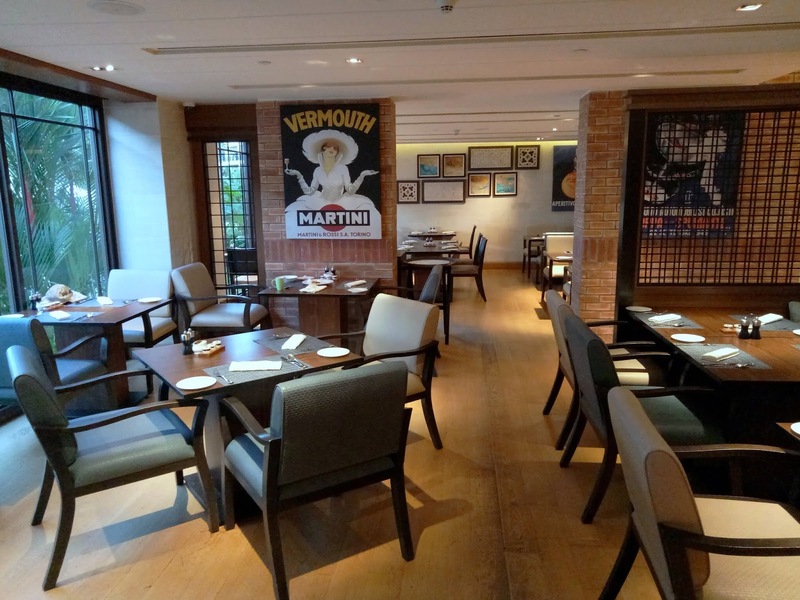 Headed by Executive Sous Chef Shantanu Seth, the restaurant primarily serves a diverse variety of regional dishes in the subcontinent. Naan is open for dinner only. Next to Naan is Kozan Teppan-yaki (高山), a Japanese restaurant led by Chef de Cuisine Ben Lee. 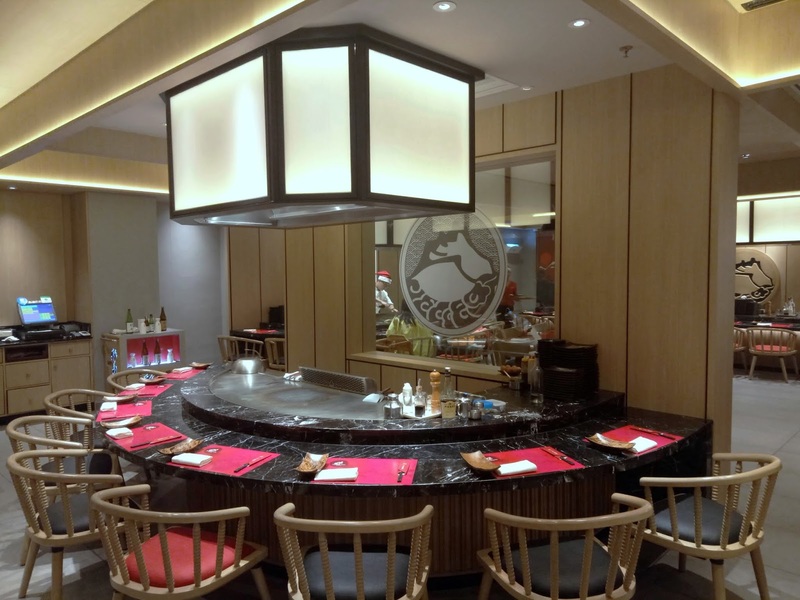 Kozan specializes in teppanyaki (鉄板焼き) fare. The restaurant has several grilling stations where food is cooked in front of diners. Like Naan, Kozan is only open in the evening. 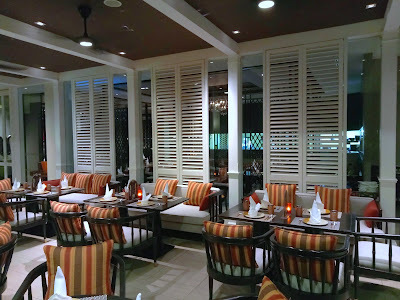 Oceano Italian Restaurant is located at the Ocean Wing. It provides both indoor and al fresco dining options. Specializing in classic Italian cuisine, Oceano's signature dishes are Margherita Pizza and Gnocchi Di Patate. 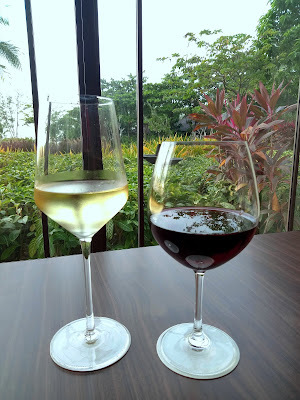 Oceano also offers a fine selection of Italian wines. Ocean Wing guests enjoy a number of perks such as complimentary pre-dinner cocktail reception in the evening. Starting at 5:00pm, the ambience is kept lively by a 3-piece music band. During the cocktail reception, Ocean Wing guests enjoy free flow of drinks including beer and wine. Delicate morsels of canapés serve to stimulate the appetite before guests make their way to dinner. Breakfast is served between 6:30am and 10:30am. Guests of Ocean Wing may opt to have breakfast at Oceano. 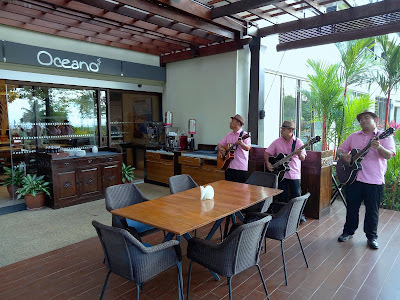 Oceano provides a more secluded setting compared to Coffee Terrace. Of course, guests can also opt to have breakfast in bed. 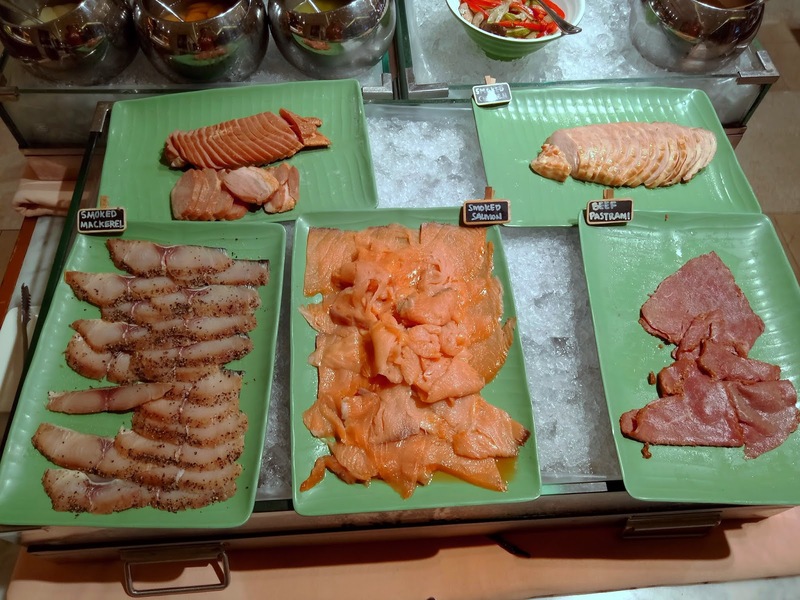 Starting with cold cuts, the buffet spread presents beef pastrami, smoked chicken and smoked duck. 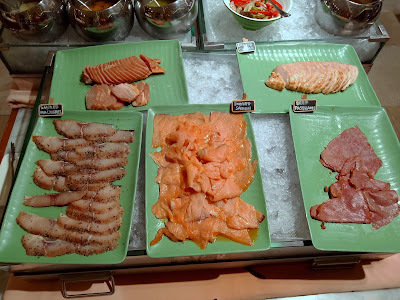 Seafood lovers can also indulge in smoked salmon and smoked mackerel. Oceano serves several types of pizza for breakfast, including one which uses focaccia as the base. Pizza toppings include beef bacon, mushrooms, black olives, capsicum and mozzarella. 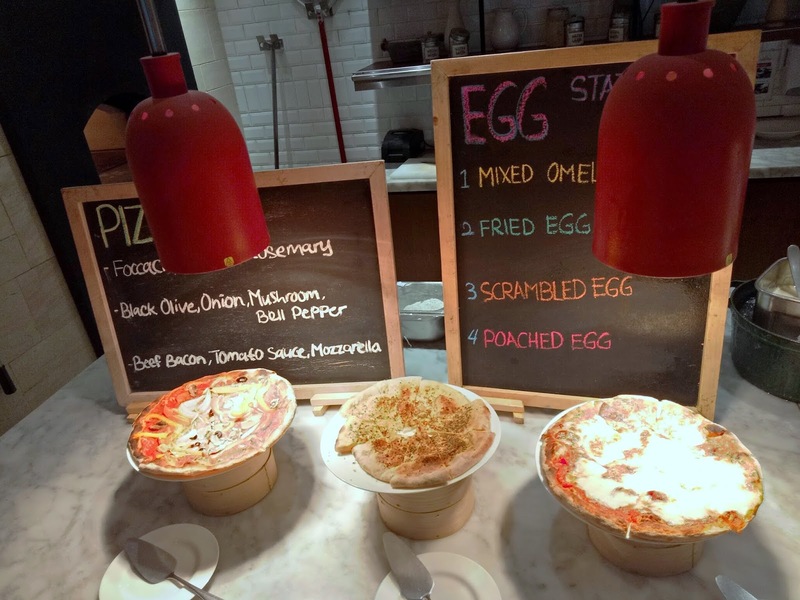 Meanwhile, the egg station is where egg dishes are prepared upon request. 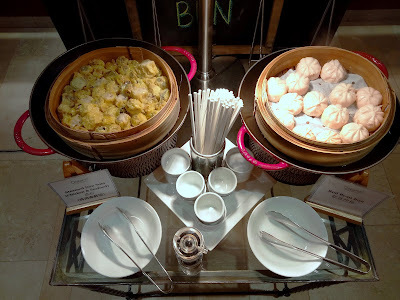 The Chinese section serves dim sum (点心), Chinese buns (包子), fried rice, noodles and congee. Korean choices are kimchi (김치), dakgangjeong (닭강정) and dakgaejang (닭개장). 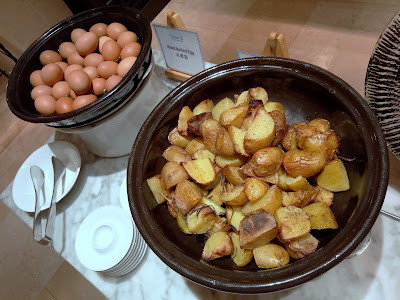 Other popular breakfast foods include chicken sausages, beef bacon, grilled tomatoes, hash browns, roast potatoes, waffles, pancakes and breakfast cereals. 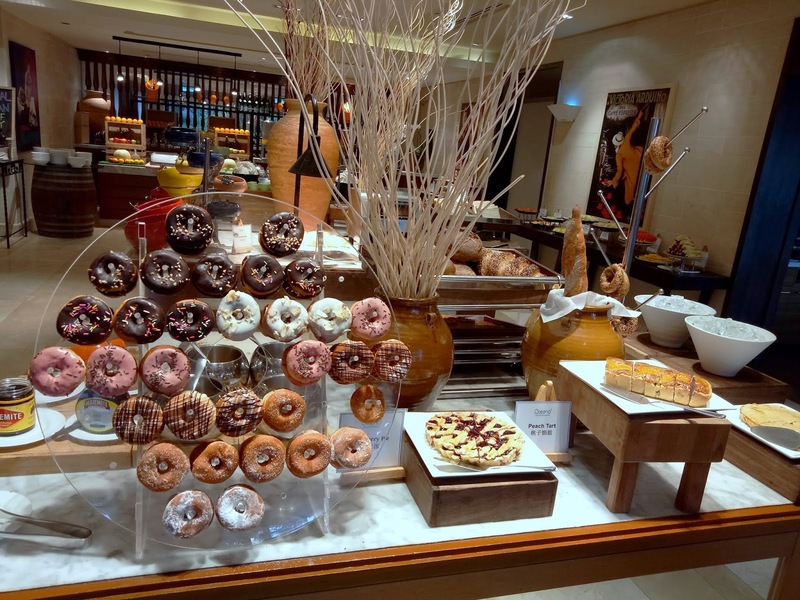 The pastry team has prepared a variety of cakes, muffins and bread to delight our sweet tooth. Also impressive are the wide selection of fruit tarts, pies and doughnuts. Gluten-free choices are available too. Once again, Rasa Ria distinctively demonstrates the impeccable Shangri-La hospitality. All staff members, from the concierge to housekeepers, pay attention to the smallest details. 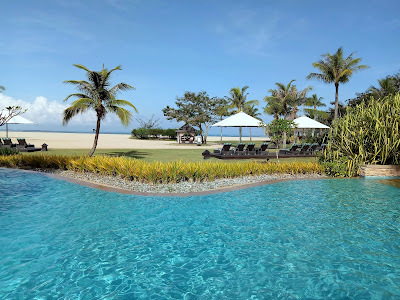 Needless to say, the pristine white beach of Dalit Beach is certainly the most unique aspect of the resort. The view is exceptionally mesmerizing during sunset. To enjoy the best room rates at Rasa Ria, reservations can be made through the resort's website. Guests are also encouraged to sign up for Golden Circle membership, which is now available as a mobile app. Golden Circle members earn loyalty points when they spend on room and food at Shangri-La properties worldwide. 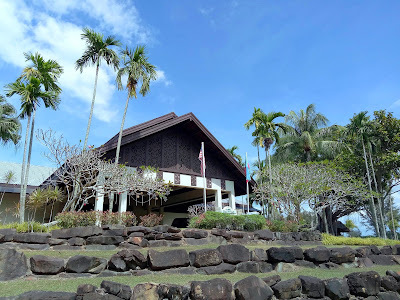 Directions: Driving along the main road from Kota Kinabalu to Kota Belud, turn left to Jalan Norowot near Tuaran. Continue driving for another 11 kilometers until you see the signboard for Rasa Ria. Turn left and drive to the end of the road.